where are the rounded corners! it looks like they might have printed some of them upside down…. you want to watch that. Congratulations Alec, I’m looking forward to my copy! I’m curious, too. Will it be printed without the rounded corners, Alec? I am very excited – I have always really loved this work. Hey, thanks for the positive feedback. I finished the book after midnight and only had one non-English speaking press guy to celebrate with. It looks to me like those are stacks of uncut pages which would mean the images will not have the rounded corners…..I could be wrong though; None the less, I can’t wait for my copy to come in. Congrats! Looking forward to seeing it. Is it really finished this week with a release date of Oct. 1? I, like half of the world, eagerly await a copy. My wife just sneers when i tell her Its kind of like giving birth, you must be exhausted. Wish the sun was shining in Seidlville, but I sort of doubt it. ENJOY, i know I will…. purchase a copy if i can afford this treasure.. the cost ? sorry i was so excited i overlooked your links ..under 40 chips count me in. Back to pevious post for a second Alec http://www.askoxford.com/results/?view=searchresults&freesearch=yeesh&branch=&textsearchtype=exact and congratulations on “Dog Days” love that work very much. How exciting!! Can’t wait to see it! Congratulations – can’t wait to get a copy. Congrats! I’ll have a celebratory beer for you. Isn’t it Oktoberfest time? Two thoughts when I saw this; one – when will my amazon pre-order become a shipping order and two – donde están las esquinas redondeadas? Really looking forward to see the book. Congratulations! great, looking forward to it! congratulations alec! Time to learn German Alec. Congrats!!! I am looking forward to getting this book. I wonder if there is any chanced to get a signed copy? I love your work and it will be great to have a signed copy if you make them available at one point. – Except for one picture, the rounded corners are gone. I made this decision some time ago. – You can never trust the release dates you see on Amazon and other sites. These books are produced in such small numbers that you are always at the mercy of the publisher and press. – You really can’t trust anything on those sites. The cover is different too. – The final price of the book will be lower than you currently see online. Don’t worry, if you pre-ordered the book, you will be charged less. More on this after it is official. – I’m sure that signed copies will be available from the Magnum book store in the future. Those stacks look very familiar to me. 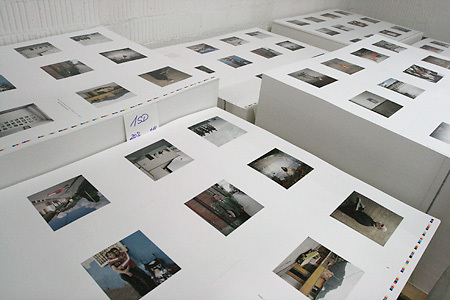 I spent a week with german publisher Kehrer Verlag in Heidelberg a few years back. Congratulations on the book – did you get to save a few of those sheets? The pre order price at amazon for all new Steidl books and BOGOTA DOGS are unbelievable cheap. 37% under list price .uh Steidl starts to beat Taschen ! Na denn mal Prost. I just received an e-mail from Amazon indicating that the release date of the book has ben delayed … and shipping will not happen until December … is that for real? Any information on why the book has been delayed? Perhaps is just a case of printing capacity and pre-order demand? today I read an article about your long journey in Bogota. I am from that city, and it was very emocional to see some of the pictures you took during those two months ( I loved the dog one). I can’t wait to buy your book..thank you so much for showing a positive side of my country….